The private seed industry has made dramatic gains in sub-Saharan Africa (SSA) in recent years, gains that are likely to have profound negative impacts upon millions of small-scale farmers across the continent, according to a new report released today by the African Centre for Biodiversity (ACB). The report, titled The expansion of the commercial seed sector in sub-Saharan Africa: Major players, key issues and trends, describes how the seed industry in SSA, far from being a homogenous bloc, is comprised of several layers. 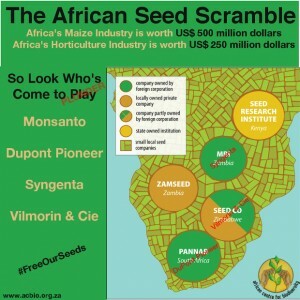 These include the largest multinational companies: Monsanto, DuPont Pioneer, Syngenta and Vilmorin; a number of large companies from Europe and Asia, many of whom specialise in vegetable crops; and a group of former national seed companies from eastern and southern Africa, such as Zimbabwe’s SeedCo, Zamseed in Zambia, Tanseed in Tanzania, and the Kenya Seed Company. Joining these established players is a plethora of emerging African seed companies, many of which have received financial and technical support from the Alliance for a Green Revolution in Africa (AGRA). Maize and horticulture are the two biggest seed markets on the continent, valued at around US$ 500 million and US$ 250 million respectively, and it is here that the majority of seed company activity can be observed. An excessive focus on maize, particularly hybrid maize, has negative implications for agricultural and nutritional diversity and farming costs. Hybrid seed must be re-purchased fresh every year and must be used in conjunction with other chemical inputs to achieve optimum yield. The spread of hybrid maize has also been integral to the recent resurgence in agricultural input subsidies across the continent. These subsidies have drained substantial amounts from agricultural budgets while creating guaranteed markets for multinational seed companies. Despite its relatively small size (less than 2% of the global total in monetary terms) the seed industry in SSA already appears to be following the same trends of company expansion and consolidation that are visible at the global level. Since 2012 DuPont Pioneer has acquired South Africa’s Pannar Seed, Syngenta has purchased Zambian seed company MRI, and Vilmorin (Europe’s largest seed company) has increased to 30% its ownership in Zimbabwe’s SeedCo. In addition, while the latter deal was being completed SeedCo sold 49% of its interest in Quton Cotton to Mahyco of India (themselves 26% owned by Monsanto). In January 2015 Monsanto moved its African headquarters from South Africa to Kenya, to be closer to potential growth markets in East Africa. These same companies are also expanding their operations on the continent under the auspices of the G8 New Alliance for Food Security and Nutrition (G8 NAFSN) and Grow Africa, two investment platforms which both have their origins in the World Economic Forum. For example, DuPont Pioneer is working to increase hybrid maize adoption in Ghana and Ethiopia, while Syngenta plans to increase certified vegetable seed adoption in Ethiopia, Kenya and Tanzania. Regional expansion is also on the agenda of many local seed companies, such as SeedCo, Tanseed, the East Africa Seed Company of Kenya and Uganda’s NASECO. West Africa and The Great Lakes region of Burundi, Rwanda and the eastern Democratic Republic of Congo, are areas of particular interest to these and other companies. “The Great Lakes region has, so far, been largely overlooked by the multinational seed companies, who have concentrated their efforts in countries with more established formal seed markets and associated infrastructure. However, this disinterest will not last very long, should local companies gain a foothold in this region,” said the author of the report, Gareth Jones. According to the report, the Alliance for a Green Revolution in Africa (AGRA) is playing a crucial role in this private sector push, including direct support to some 80 local seed companies across the continent. A small number of these companies are now being targeted by a host of agricultural investment funds that have been established with donor and private philanthropic capital. These include the African Seed Investment Fund, established with US$ 12 million from AGRA and the Injaro Investment Fund, a US$ 49 million West Africa-focused fund supported by major donors including the governments of the United Kingdom, the Netherlands, France and the Soros Foundation. The investment sums involved are much larger than AGRA seed company grants, which hints at a narrowing of focus to support the seeds of commercially lucrative crops. It also suggests an economies-of-scale approach that will result in a diminishing number of larger local seed companies, all likely acquisition targets for the global seed giants. Nearly a decade after its establishment AGRA itself appears to be undergoing something of a transition, with a much more explicit focus on private seed companies. “AGRA’s role as implementing partner of the G8 New Alliance’s US$ 47 million Scaling Seeds and Technology Partnership (SSTP), and its plans to work more directly with the influential African Seed Trade Association (AFSTA), suggest that we are entering a critical juncture in Africa’s seed sector transition,” continued Jones.